Rich and Rare is an anthology of short stories, poetry and artwork by some of Australia's leading talent. Out November, and already receiving a 5 star review from Bookseller and Publisher, contributors include: Shaun Tan, Leigh Hobbs, James Roy, Justin D'Ath, Kirsty Murray, Simon Higgins, Gary Crew, Scot Gardner, Michael Gerard Bauer, Gabrielle Wang and many more. 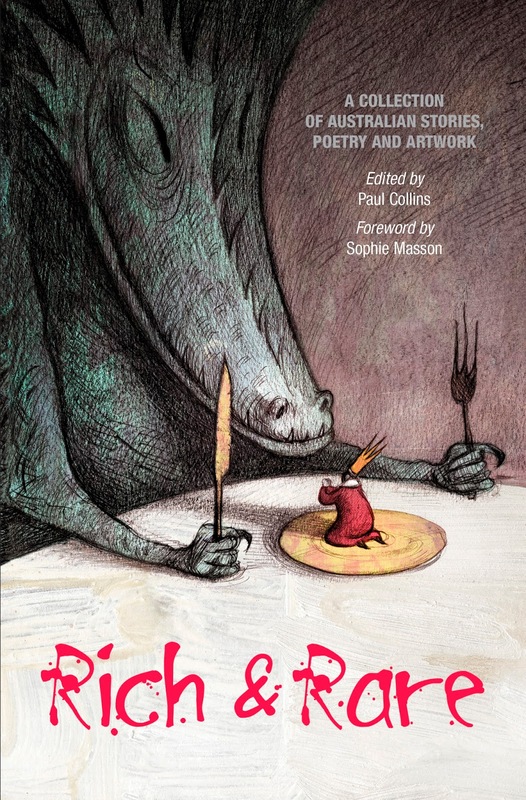 Oh--and there's also some pretty spectacular cover artwork by Shaun Tan. We spoke to publisher and editor Paul Collins about this special volume. Where did the idea for Rich & Rare come from? Any book has its genesis. I remember with Trust Me Too, it was Janeen Brian sending me a story after I’d published Trust Me!. So I held on to her story for eighteen months or so till more stories trickled in. With Rich & Rare, it was a story from Justin D’Ath. I held on to that, too, for around eighteen months, before I had a complete anthology. As an aside, the anthologies are among Ford Street’s top five sellers. I also enjoy the process of working on short stories. Counting the Spinouts and Thrillogies anthologies I co-edited with Meredith Costain, I’ve edited around sixty anthologies now. Which genres of writing does the book include? Just about everything: romance, SF, fantasy, crime, adventure, horror, humour. I think there’s something for everyone in it. Why are anthologies so important? Many of us no longer have time to read house brick-sized books. Short stories contain the ideas but without the padding. They’re easy to pick up, delve into, finish, and then move on to the next without wondering where you were up to. I’m sure there are many more reasons why they’re important. Why do you think kids enjoy them so much? For much the same reason as I’ve mentioned. Too, there are a great many reluctant readers. Short stories can be very much accessible, certainly more so than novels that some might be daunting to reluctant readers. Would adults enjoy it as much? As an adult, I enjoyed every story for various reasons. There are a great many ideas and styles in Rich & Rare. I guess it depends on whether or not the adult reads YA literature. Remember when the Harry Potter series was in vogue? Adults read it in droves. Again, we’re time-poor these days, and an accessible collection of short stories by some of Australia’s leading authors has to have its merits. We also have some outstanding art in the anthology. Will there be another anthology from Ford Street? Possibly so. I guess if someone sent me a terrific story I’d offer a contract on the proviso it could be another eighteen months before I exercised the option to publish! Learn more about Rich & Rare, and Ford Street's other books at their website. Teaching notes for this book are already available at this link.